As a participant of the Erasmus+ Traineeship program students can spend 2-12 months with completing their traineeship at a company or higher education institution abroad, in case they are enrolled in any BA/MA programs of METU and have an active student status during their traineeship period. Any companies, small-enterprises, research institutes or higher education institutions (except for National Offices, Hungarian Embassies and EU – bodies) in EU member states and Iceland, Lichtenstein, Norway, Turkey. In addition to your salary, you also get an Erasmus Traineeship scholarship. 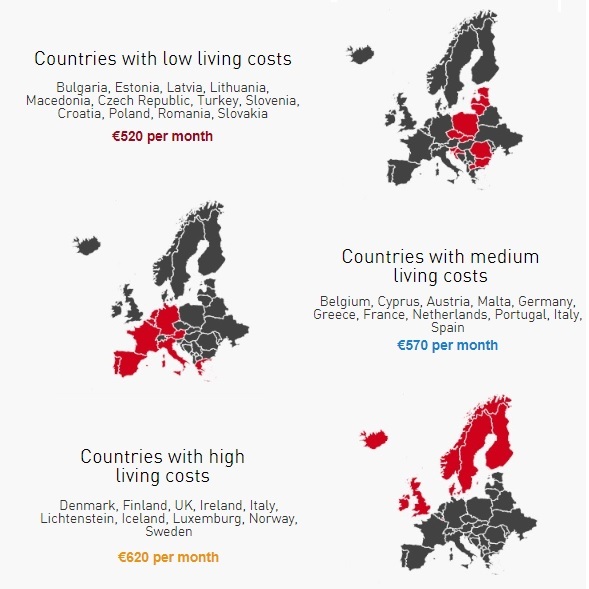 However, depending on the cost of living in the host country, the amount may vary. *The total length of time spent abroad (study mobility and traineeship) under the Erasmus+ program cannot exceed 12 months per each cycle of study (BA, MA), independently from the number and type of mobility activities (such as previously completed traineeship or studies funded by Eramsus+ or the so-called “zero grant mobility”, when the student does not receive any financial aid, also counts in the 12 months). The application needs to be submitted ONLINE. Each student should start only 1 application. When applying to a company/enterprise please look for the OPEN LOCATION TRAINEESHIP option on the application platform. Students submitting their application accept the terms and conditions of the call. Application deadline: continuous until 15 April 2018. The evaluation is performed continuously, decision-making may take up to 2 weeks. 1148 Budapest, Nagy Lajos király útja 1-9. main building, F110. Evaluation of applications: Submitted applications are evaluated by the International Directorate, the final list of applicants suitable for participation in the program will be compiled in accordance with the quota specified by the Tempus Public Foundation. Criteria for evaluation: At the assessment, priority will be given to students whose placement can be considered as a compulsory placement. The evaluation of applications submitted for traineeship is based on the detailed program of the traineeship, language skills of the applicant, and it is also considered if the position fits the study program of the trainee. • Active study status at METU during the whole period of the Erasmus+ traineeship. • Learning Agreement for Traineeship signed by all 3 parties (student, host institution, home institution), including the number of credits accepted by METU (only for compulsory traineeships). • OBLIGATORY INTERNATIONAL Accident and Health Insurance, or Health Insurance Card of the European Union. • A valid visa for the candidate to the target country, if necessary. • In case of previously completed Erasmus+ mobility, the student must not exceed the maximum 12 months period per study cycle with the scholarship months awarded at this call for proposal. • The minimum length of time spent abroad is 2 months, students need to prove the period they spent at the partner by the official certificate of traineeship period issued by the host coordinator/manager. • Student needs to receive an evaluation (After mobility part of the Learning Agreement) issued by the host company/ university upon completing the internship. 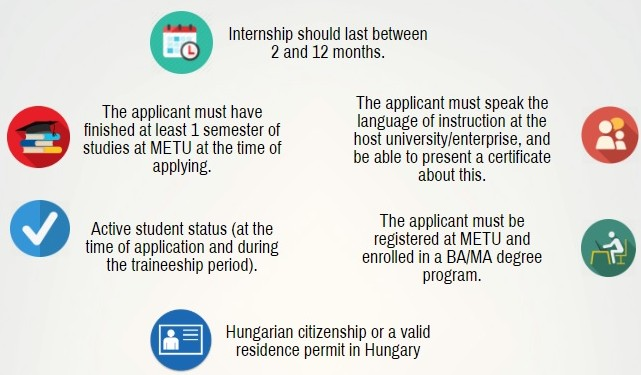 • Stipends and social contributions that students are eligible for at Budapest Metropolitan University will continue to be transferred to them during their traineeship abroad, but if they are fee-paying students at Budapest Metropolitan University, they will have to transfer their tuition fee for the semester (Except the case when the mobility for traineeships is fulfilled after the graduation). • In case of fulfilling the internship at a Higher Education Institution ERASMUS+ students do not have to pay the tuition fee to the host university and are fully entitled for all rights that entitles the registered students’ of the host university.